An increasingly common impairment we’re getting requests for - and underwriting concerns with - is marijuana or cannabis use. The frequency of use has increased in today’s society, along with legalization in some states for recreational use. Many more have OK’d the use of marijuana for medicinal purposes. As a result, marijuana has become a frequent topic for underwriting discussion. Regardless of your personal views on the subject, use of the drug is more prevalent than ever and we must address the issue when it arises during the life insurance application and underwriting process. Cannabis is a natural psychoactive drug that comes from the flowers and leaves of the hemp/marijuana plant. Tetrahydrocannabinol (THC) is the primary ingredient in cannabis that causes euphoria and intoxication. Cannabis is most commonly smoked as a cigarette or in a pipe. It can also be taken orally, either by eating it directly or mixing it with food products. Short-term memory, attention, motor skills reaction time, and skilled activities are impaired while the individual is intoxicated. Cannabis contains carcinogens, and evidence suggests that heavy use may be associated with oral cavity, pharynx, esophageal, and lung cancers. Because of those concerns, many carriers will assign smoker/tobacco use rates for any use. For underwriting consideration, the first thing we must determine is whether the use is recreational, or if the proposed insured has been issued a prescription for medical use. If for medicinal purposes, underwriting is going to be looking at the specific issue the marijuana is being used to treat. Medical legalization is intended to provide beneficial treatment for those suffering debilitating symptoms. However, severity is subjective and open to interpretation. These uses may include severe pain, muscle spasms, severe arthritis, cancer or HIV-related symptoms, weight loss, nausea, glaucoma, and seizures from epilepsy. This highlights the need for full information considering not only potentially serious and uninsurable conditions, but also the high potential risk for misuse. Heavy use, for those whose use frequency is more than 4 times weekly, or daily use. There is evidence that many cannabis users do not abuse other drugs. However, multiple drug and alcohol use can be encountered with cannabis use; when combined, it is more toxic than each drug alone. Is the use for recreational or medicinal purpose? If for medical concerns, what is the underlying health condition?... and what is the severity? Have there been any problems with law enforcement?...or Dr’s concern over use? Any other drug use or alcohol concerns? With many carriers, the underwriting of an applicant with marijuana use will often end up with Standard Smoker offers at best...but we do have some who look at this more aggressively. Depending on frequency and/or whether it’s for medicinal use, we still have a few that can rate at Standard Non-smoker or, occasionally, even at Preferred classes. Each individual case will be looked at based on its own characteristics. 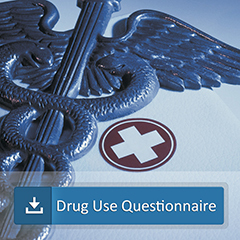 Please see the Pinney Drug Use Questionnaire, which will help you gather the pertinent info we’ll need to help evaluate your case. As always, we’re here to help answer your questions and provide the best underwriting services possible to help you place your case.